TAYLOR, John W., a Representative from New York; born in Charlton, N.Y., March 26, 1784; received his early education at home; was graduated from Union College, Schenectady, N.Y., in 1803; studied law; was admitted to the bar in 1807 and commenced practice in Ballston Spa, N.Y.; organized the Ballston Center Academy; justice of the peace in 1808; member of the state assembly in 1812 and 1813; elected as a Republican to the Thirteenth Congress and reelected to the four succeeding Congresses, elected as an Adams-Clay Republican to the Eighteenth Congress, reelected as an Adams candidate to the Nineteenth and Twentieth Congresses, and elected as an Anti-Jacksonian to the Twenty-first and Twenty-second Congresses (March 4, 1813-March 3, 1833); chairman, Committee on Elections (Fourteenth and Fifteenth Congresses), Committee on Revisal and Unfinished Business (Fifteenth Congress), Committee on Elections (Sixteenth Congress); Speaker of the House of Representatives (Sixteenth and Nineteenth Congresses); unsuccessful candidate for reelection in 1832 to the Twenty-third Congress; resumed the practice of law in Ballston Spa, N.Y.; member of the state senate in 1840 and 1841, but resigned in consequence of a paralytic stroke; moved to Cleveland, Ohio, in 1843, and died there September 18, 1854; interment in the Ballston Spa Village Cemetery, Ballston Spa, Saratoga County, N.Y.
Papers: 1804-1846, 2.8 linear feet. The collection consisst of correspondence and papers of John W. Taylor. The correspondence is mainly concerned with politics, particularly during 1814-1833, when he was a U.S. Congressman representing Saratoga County (N.Y.), part of the time serving as Speaker of the House of Representatives. The letters pertain to national, state and county politics, elections, banking, the tariff, slavery, internal improvements, land policy, national figures, New York politicians, the post office department, legislation, and patronage, as well as personal matters. Some of his more frequent correspondents were: Jesse Buel, DeWitt Clinton, Esek Cowen, Samuel Cook, Alfred Conkling, John Cramer, Stephen Decatur, John A. Dix, Isaac M. Ely, Jonathan Fisk, James Geddes, Jabez D. Hammond, Salma Hale, Richard M. Livingston, Henry C. Martindale, John McLean, J.B. Mower, Charles Miner, Hezekiah Niles, Eliphalet Nott, Lemuel C. Paine, George Palmer, Thomas Palmer, John Russell, Ebenezer Sage, John Savage, Ambrose Spencer, James Tallmadge, John L. Viele, Daniel D. Tompkins, Jane Taylor (his wife), Martin Van Buren, and William Woodbridge. There is also a group of 83 letters from Taylor to his wife, 1813-1833. Miscellaneous papers include speeches, mostly manuscript, but one, delivered in Ballston Spa on October 8, 1831, printed as a pamphlet supplement to the Schenectady and Saratoga Standard; certificates, including stock certificates in the Mohawk Bridge and Ballston Turnpike Company; deeds, mortgages, and other land papers, including two deeds in the name of his father-in-law, James Hodge; petitions; memoranda; several diplomas from Union College; circulars; receipts; records of the findings of an inquest held in 1812; minutes, and lists. The miscellaneous papers also contain a few letters, including an unsigned statement requesting a pension for service during the Revolutionary War with the militia in Hackensack (N.J.). There are also large numbers of invitations and visiting cards and a list of visits received, 1826-1827. The visiting cards are bundled, and some bundles are dated. An undated broadside entitled The People's Nomination describes a meeting held at Ballston Spa at which Taylor was nominated for Congress. There is also a ribbon badge worn at the opening of the Erie Canal in 1825. Papers: 1846, 3 pages. A letter from John W. Taylor to Daniel Webster written on June 30, 1846. In the letter, Taylor describes the highlights of his trip to Boston. Papers: 1816, 2 items. Two letters written to John W. Taylor while he was a member of the United States House of Representatives concerning the financial affairs of W. D. Cheever. Papers: In the Hale Family Papers, 1720-1950, 40 boxes and 19 volumes. Correspondents include John W. Taylor. Papers: 1810-1854, 0.2 linear foot. This collection of John W. Taylor is composed of a hand-written genealogy and a bound volume that serves as docket and personal journal containing newspaper clippings, receipts and letters. The bound volume began as a legal docket kept by John W. Taylor from 1809 to 1811, while he served as a justice of the Saratoga County, New York, Court of Common Pleas. It records court cases, receipts of payment, receipts of land grants, marriages, and his duties and transactions as executor of John Richards's estate. A letter regarding a land grant, written by William A. Crawford, (1772-1834) Secretary of War, is also tipped into the ledger. Names represented in the docket and journal include: Clothier, Cook, Curtis, Richards and Seeley. A finding aid is available in the repository. Papers: In the Miscellaneous Manuscripts T - V, ca. 1790-1979, 1.2 cubic feet. The papers include letters from Congressman John W. Taylor to his wife, 1814-1830. Papers: 1818, 1 page. A letter from John W. Taylor to "Officers of the Military Academy at West Point." written on September 25, 1818. In the letter, Taylor introduces Hiram Boss, an appointee to the Academy. Alexander, DeAlva Stanwood. "John W. Taylor." Quarterly Journal of the New York Historical Association 1 (January 1920): 14-37. ------. "Only One Speaker from Empire State." State Service 6 (September - October 1922): 336-42. Johnson, William R. "Prelude to the Missouri Compromise: A New York Congressman's Effort to Exclude Slavery from Arkansas Territory." New-York Historical Society Quarterly 48 (January 1964): 31-50. Spann, Edward K. "John W. Taylor, The Reluctant Partisan, 1784-1854." Ph.D. diss., New York University, 1957. ------. 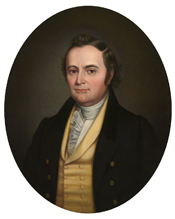 "The Souring of Good Feelings: John W. Taylor and the Speakership Election of 1821." New York History 41 (October 1960): 379-99. Taylor, Elisha. Genealogy of Judge John Taylor and His Descendents. Detroit: Richmond and Backus, 1886. Taylor, John W. An address delivered at the celebration of the fiftieth anniversay [sic] of the independence of the United States, in the village of Ballston Spa. Ballston Spa, [N.Y.]: Printed by J. Comstock, 1826.